I am pleased to welcome my first guest blogger, Janet Hines. Her post is titled I am a Sheep of Your Pasture. I took this picture in Spain while driving from Antequera to Malaga. It took my breath away. Pulling over, rolling my window down – my breath stilled, my heart overwhelmed. 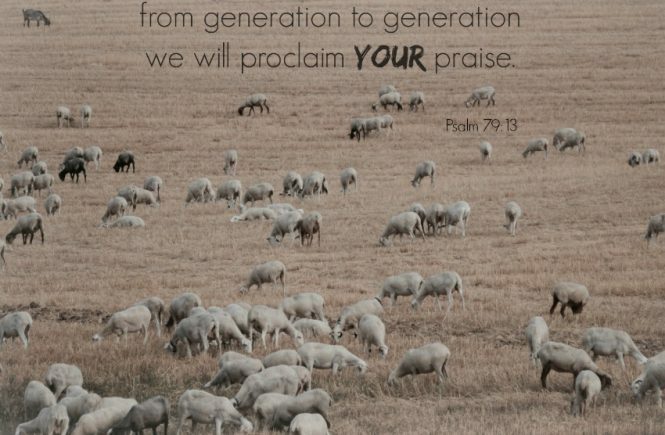 Many of the sheep in the pasture had bells around their necks – there were probably a thousand sheep . . .
. . . and the sound was one of the most beautiful, spiritual sounds ever filling my ears, moving into my heart, my breath slowing in an attempt to match the rhythm. The sheep farmers put the bells on many of the older sheep to ward off predators. If the shepherd hears the bells ringing loudly, they know danger is present. As the anxiety of the sheep increases so does their movement. The tone of the bell changes. It serves as an alarm. The shepherds then know their sheep need them. Yet, when all is well and every sheep is calm, the beautiful music fills the air. Isn’t it like that when we live with God as our Shepherd? He is ever present. Always caring for us as the shepherds care for their sheep, yet not always visible. Always ready to protect us and enable us with the means to sound alarm. Please follow this link to read more of Janet Hines post. Janet Hines lives in Covington, Louisiana. Mother of four and grandmother of seven, her life passion is to live sharing the hope of God as she has been relentlessly filled. She is the co-founder of Mi Esperanza – a non profit organization operating in and around Tegucigalpa, Honduras. The primary focus of the organization is women’s education. Mi Esperanza provides not only skill development but life empowering education allowing them to gain employment or begin their own businesses with the micro loans offered to alumni of the programs. Her other passions include travel, photography and writing. You can find Janet Hines at these social links.